This still life with a vase of flowers has been attributed to Jan Davidsz. de Heem. Born in Utrecht, De Heem moved with his family to Leiden in 1625 and his first known works date from that decade. At this period he focused on still lifes and his most important paintings are compositions with piles of books, documents, papers and musical instruments, painted in a restrained palette with an emphasis on whites, browns and greys. These compositions have been interpreted as vanitas themes and clearly refer to the intellectual life and to knowledge. 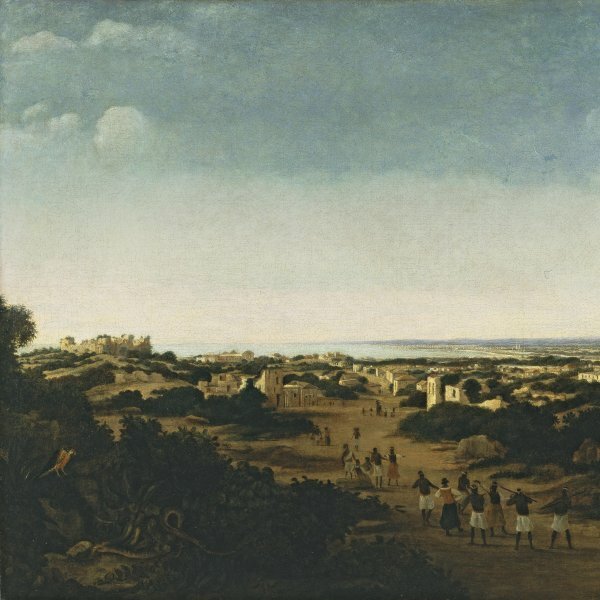 In the 1630s the artist moved to Antwerp where he remained until around 1658. In Antwerp, De Heem made contact with the Flemish school and his painting became more complex and elaborate. His still lifes of this period depict large tabletops with a wealth of foodstuffs, objects and animals in a stepped arrangement framed by elaborate curtains and including a landscape in one corner. His work from his earliest years onwards reveals an outstanding ability to interpret colour, a feature that was further developed during his Antwerp period. Flowers in a glass Vase with Fruit reveals the influence of another great still-life painter, Daniel Seghers. In the present work De Heem has abandoned the use of a symmetrically balanced bouquet and depicts a more natural, free arrangement. In addition to the roses, lilies, irises, daisies, peonies and bindweed that provide the principal motifs he also adds pieces of fruit such as the mandarins, cherries, strawberries and acorns arranged on the ledge, as well as some delicate ears of corn. The composition and arrangement of the elements is typical of De Heem, who produced a number of works similar to this one at around this time. Typical features include the use of a dark background in which the light defines areas of the ledge or its edge and the depiction of the interior of the vase through which we see precisely defined stalks such as those of the roses with their thorns. Another recurring motif is the inclusion of the reflection of a window on the surface of the vase. De Heem balanced the composition, placing the largest, most fully opened flowers in the centre while the smallest flowers and the stalks lean over the edge of the vase, and the fruit on the right balances the weight of the roses. The inclusion of flowers such as the iris at the top, which is the symbol of the Virgin, has led to the suggestion that the work includes elements of religious symbolism. This is further reinforced by the anemone that refers to the transitory nature of life, and to the ears of corn, symbol of the Resurrection, of eternal life and the Eucharist. Gaskell, however, emphasised the fact that these compositions should primarily be seen as a display of the painter’s abilities in the depiction of the animal and plant world. 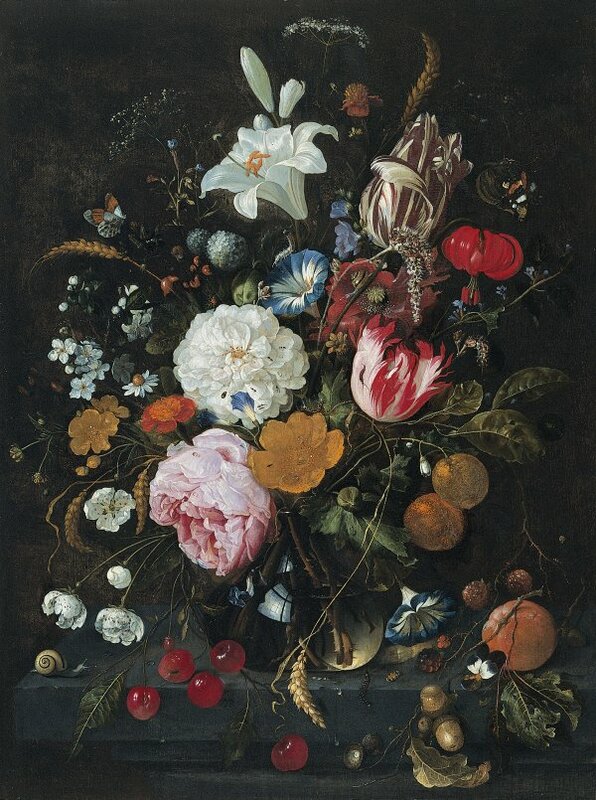 The re-use in various works by the artist of some of the elements on the tabletop such as the rose that leans over to the left indicates that De Heem made use of sketches and drawings in the preparation of his works.